From healthcare to communication, from work to leisure, the impact of technology on our lives continues to accelerate — and widen. USC has been at the forefront of turning creativity into reality in sectors including the sciences, humanities, engineering, medicine, entrepreneurship, the arts and entertainment. Join us in Tokyo — a global center of industry and innovation — as we explore how to improve and enhance lives worldwide. USC is gearing up to host its 2017 Global Conference in Tokyo, but the connections between USC, Japan and Japanese students date back nearly as far as the history of the university itself. In 1889, just nine years after USC opened its doors, the university graduated its first Japanese student, K. Wada, from USC’s college of medicine. USC’s first Japanese Student Union was formed in 1910. And at least two of the university’s students went on to become Prime Minister of Japan: Takeo Miki and Shinzo Abe. The famed violinist Midori Goto, known worldwide simply as “Midori,” will perform at the Welcome Dinner and Opening Celebration for the 2017 USC Global Conference in Tokyo, Japan, on Thursday, Sept. 21. Contemporary dance repertory performed by students from the USC Glorya Kaufman School of Dance will highlight the Gala Dinner on the closing night of the 2017 USC Global Conference, to be hosted at the Grand Hyatt Hotel in Tokyo, Japan, on Sept. 21-23, 2017. Blurred motion on the Subway in Tokyo. Shoot from Istocklypse Tokyo 2015. The 2017 USC Global Conference will take place in the city of Tokyo, Japan, on September 21 – 23, 2017 at the Grand Hyatt Tokyo located in the heart of the cosmopolitan Roppongi district. 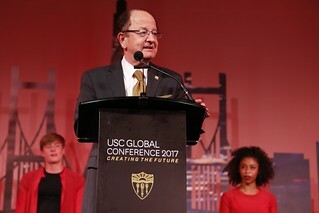 President C. L. Max Nikias presents Bob Iger with USC jacket as Willow Bay looks on. The 2015 USC Global Conference was held October 29-31 in Shanghai, China, at the Grand Hyatt Shanghai. 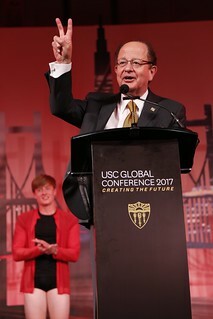 Drawing a record crowd of more than 700 registered guests, Shanghai was the largest and most successful USC Global Conference in the event’s history. Founded in 1969, Korean Air is now a leader in the global transport network and is performing a pivotal role in further enhancing Korea’s progressive reputation around the world. One of Asia’s first-class financial institutions and second largest listed financial holding company in Taiwan. Philanthropists Mr. and Mrs. Ronnie C. Chan (Trustee and MBA, ’76) have a long history of support to USC. In 2014, their gift established the USC Mrs. T.H. Chan Division of Occupational Science and Occupational Therapy, the first named and endowed program of its kind in the nation. Founded in 1979 and headquartered in Mumbai and Silicon Valley, Tandon Group operates several successful businesses and incubates next-generation startups in India. CAI Global is an Asia-headquartered holding company that manages private equity investments on renewable energy, biotechnology, consumer electronics and real estate development. Chungnam Group of Companies is a global corporation of technology, manufacturing, and retailing. Chung Nam has four core businesses: Chung Nam Watch, CN Innovations, CN Fashion and CN Lifestyle. With 75 years of excellence in the area of pharmaceutical and medical supplies distribution, LCH is Hong Kong’s most trusted name in the field. Eastern Technologies Holding Limited, a global manufacturing leader in the audio industry, is engaged in the research, development, production, and distribution of transducers, speaker systems and headphones for consumer, professional, automotive and commercial applications. Established in 1994, Lee & Man Paper Manufacturing Ltd (“Lee & Man Paper”) has grown from a small company into a world leading paper and pulp manufacturer. MoneySQ.com is Hong Kong’s first legitimate crowdfunding + online lending platform. With a mission "Create Value through Sharing," we aim to connect investors with idle cash in their accounts and borrowers with financial needs. Established since 1959, Salon Films, with extensive experience and innovative exploration, is one of the leading film companies in Hong Kong and provides various film production services and creative media plans, covering Asia and worldwide. Shanghai Caohejing Hi-tech Park Innovation Center has committed itself to cultivating and supporting technology intensive enterprises and promoting commercialization and internationalization of scientific and technological achievements. Shanghai Kaixin Asset Management Co., Ltd. is a professional service provider, focusing on commercial real estate investment, planning, investment operations, marketing agents, committed to providing the most reliable commercial real estate services and building China’s outstanding commercial real estate brands. Taipei Trading Company is one of the most reputable and oldest trading firms in Taiwan. Inspired by the dessert-loving culture in North America, Twinkle® is founded by a group of passionate designers who are dedicated to bring the trend of bakery decor to Europe, Asia and all over the world. The USC Alumni Association’s mission is to support the overall advancement of USC by engaging a Trojan Family of more than 367,000 alumni members worldwide and for life, while building a culture of philanthropy among the Trojan Family. Since 1997, the USCAAHK has promoted and strengthened the USC Trojan family network in Hong Kong and within Asia through activities and events allowing Trojan alumni to grow their networks and foster both business and social relationships.